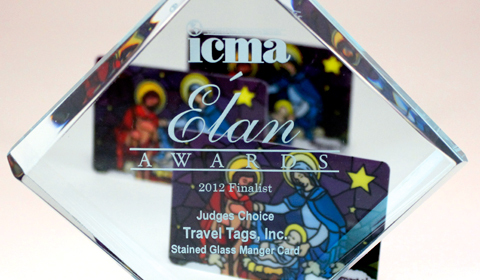 Inver Grove Heights, MN - Travel Tags, Inc. has been recognized for excellence by the International Card Manufacturers Association (ICMA), a global trade association for card manufacturers, personalizers, issuers and suppliers, at the 2016 Elan Awards for Card Manufacturing Excellence. Jeffrey Barnhart, ICMA founder and executive director, revealed the winners at a festive carnival themed evening reception and dinner held April 6 at Universal's Loews Royal Pacific Resort in Orlando, Florida, during the 26th Annual ICMA EXPO. TTi participated in the Loyalty, Promotional and Gift Cards category, wining both Finalist spots for the Cabela's Shooting Clay Lenticular card, manufactured for Cabela's, and the Starbucks Special Edition Kona Heritage Card, manufactured for Starbucks Coffee Company. Cabela's was interested in a lenticular card for their gift card offering and approached an expert in the field. Travel Tags' Creative Team was able to enhance Cabela's artwork and make it lenticular-ready with multiple motion and depth effects. For this particular card, the lenticular print features an up/down multiphase effect, flipping between three stages of a person shooting a clay disc mid-air. This special-edition Kona Heritage Card is made with recycled burlap coffee bags and features a design of the original Pike Place, celebrating the birthplace of Starbucks Coffee Company. This one-of-a-kind Kona paper is the result of converting post-consumer waste into a whole new element. It is estimated that more than 10 million burlap bags of coffee are traded globally, providing thousands of tons of burlap for repurposing into products like this paper. In each card, a slight rough texture can be felt with noticeable pieces of jute, or paper fibers. The card features beautiful gold foil stamping, informing the recipient of its unique elements. In addition, the top layer has been debossed in register to the printing, highlighting the Pike Place storefront. In the global arena of world-class cards, the ICMA Elan Awards for Card Manufacturing Excellence celebrates the pinnacle of design innovation, security, and technical achievements in the industry by leading manufacturers from around the globe. "We're proud to be recognized in conjunction with the pretigious brands we work with. It's our mission to engage with clients to not only provide them with a product but to create growth for their brands through innovative solutions," says Jeff Horst, Creative Director for TTi. Click here for a complete list of winners and finalists of the 2016 Elan Awards. Congratulations to all for their achievement! INVER GROVE HEIGHTS, MN - Travel Tags, a global manufacturer and fulfillment house of unique gift card solutions, is embarking on their 40th anniversary in 2013. The company has an impressive history as an innovative trend leader; generating customer-driven solutions, quality products and on-time delivery as a brand partner for every card need. 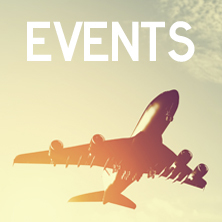 The company will celebrate their customer relationships, employees and partnerships with appreciation events throughout 2013. The organization began in 1973 as a printer of luggage tags and travel accessories in Minneapolis, MN and throughout their 40 year history has strategically acquired key industry assets. In 2012, Travel Tags shipped to 35 countries and produced over 500 million gift cards. Travel Tags is a multi-year winner of the International Card Manufacturers Élan Award, earning such honors as People’s Choice, Judges Choice and Best Gift Card of the year. The organization services clients at top fashion retailers, consumer product manufacturers and entertainment producers with on-demand or large volume orders and turnkey solutions that include design, eCommerce, card fulfillment, secure packaging and personalized green alternatives.